Thomas B. Fordham Institute - America's leading source of analysis, commentary and purposeful action in pursuit of educational excellence for every child. Standards Central is a one-stop-shop for all of the Thomas B. Fordham Institute’s recent reviews of state, national, and international curriculum and testing standards. Visit the site. In Ohio, State Superintendent Heffner makes case for more demanding K-12 expectations. Read about it in the newest Ohio Education Gadfly. Mike Petrilli looks at the newly release NAEP scores and wonders about the effect of Reading First. With the tenth anniversary of NCLB fast approaching, that law’s legacy continues to be fiercely contested. This new analysis of NAEP scores—focusing on Texas and on the entire nation—by former NCES commissioner Mark Schneider finds that solid gains in math achievement coincided with the advent of "consequential accountability," first in the trailblazing Lone Star State and a few other pioneer states, then across the land with the implementation of NCLB. But Schneider warns that the recent plateau in Texas math scores may foreshadow a coming stagnation in the country’s performance. 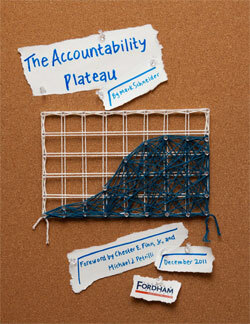 Has the testing-and-accountability movement as we know it run out of steam? How else might we rekindle our nation’s education progress? Download the paper to find out. In this policy brief, Public Impact’s Joe Ableidinger and Julie Kowal examine the merits of the charter incubation model, outline specific strategies for supporting it, and profile organizations around the U.S. putting it into practice. The authors explain that through the strategic recruitment, selection, and training of talented leaders—and support of them as they launch or expand new charter schools—incubators offer charter school advocates an important tool in guaranteeing quality school choice. Download the brief to learn how. School reforms abound today, yet even the boldest and most imaginative of them have produced—at best—marginal gains in student achievement. Instead of shoveling yet more policies, programs, and practices into our current system, we must tackle head-on the obstacles to reform posed by existing structures, governance arrangements, and power relationships. 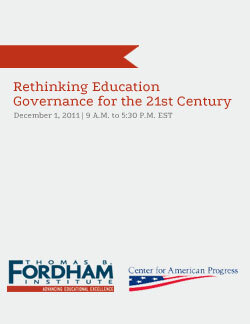 To that end, Fordham and the Center for American Progress have commissioned fourteen top-flight thinkers to probe the structural impediments to school reform and to offer provocative alternatives. 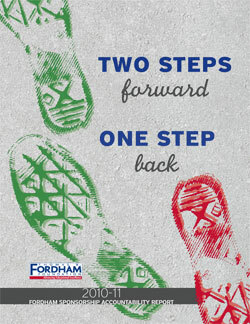 The Thomas B. Fordham Foundation is pleased to share its latest annual Sponsorship Accountability Report, Two Steps Forward, One Step Back. 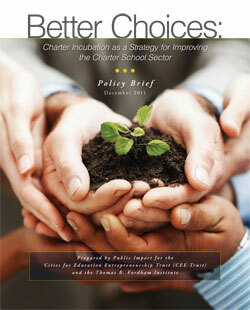 The sixth of its kind, the report reflects on Ohio’s charter school policy environment and the performance of Fordham sponsored charter schools – in terms of absolute achievement, growth, and adherence to goals set forth in our authorizing contract – as well as developments in state law over the year. Despite some tough battles during the state budget as it relates to holding authorizers (and operators) accountable, overall Fordham and its schools had an encouraging year, with Fordham sponsored-charters making achievement gains and positioning themselves to do even better in the future. The latest installments of the Thomas B. Fordham Institute’s Creating Sound Policy for Digital Learning series take up the implications of this education revolution for teachers and school finance. 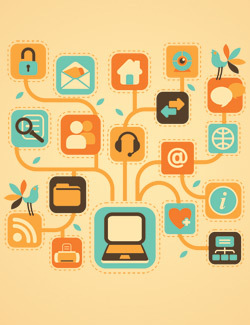 Bryan and Emily Hassel describe how digital learning could unbundle teacher roles in ways that would reshape the field to the benefit of both educators and students. They also show how existing policies could hinder that transformation. Paul T. Hill delves into why our present school-funding system presents a uniquely serious threat to digital learning’s promise, and proposes creative yet streamlined solutions to the problem. Explore both papers for a preview of American education’s future. The Thomas B. Fordham Institute is the nation's leader in advancing educational excellence for every child through quality research, analysis, and commentary, as well as on-the-ground action and advocacy in Ohio.